Over the weekend, ESPN announced a few shakeups. Jemele Hill, once touted as a rising star at the network, ruffled feathers this year after making numerous politically controversial statements. Among her most talked about social media comments was when Hill tweeted President Trump was a “white supremacist”. ESPN, under new leadership, has been trying to avoid politics, and Hill wasn’t a good fit anymore, so they bought out her contract. In other ESPN news, Michelle Beadle is leaving the new morning show “Get Up” this week. Beadle made her own controversial comments last week when she stated she wasn’t going to watch football anymore. She said, “There’s a reason why this will be the second season I don’t watch NFL and I don’t spend my Saturdays watching college football either. I believe that the sport of football has set itself up to be in a position where it shows itself in the bigger picture to not really care about women — they don’t really care about people of color.” Beadle, who has a $5 million dollar contract with the network, will now work in Los Angeles for NBA Countdown. New England QB Tom Brady hung up the phone and abruptly ended an interview on a Boston radio station after repeated questions about his trainer Alex Guerrero. Last season Guerrero was banned from traveling with the team due to his “unorthodox” training methods. He’s seemingly very close to Brady, however, and traveled on the team plane this week in their matchup with the Panthers. It’s unclear why he doesn’t want to answer questions about Guerrero. In college football news, USC named freshman (a true freshman not a redshirt) JT Daniels as their starting quarterback this season. 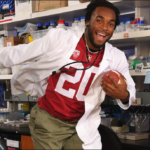 Stanford running back Bryce Love, a Heisman candidate, wrote a first person account in the new issue of Sports Illustrated explaining why he loves football, and why he chose to remain at Stanford for his senior year instead of entering the NFL draft. Love explained there’s life after football, and his dream is to become a pediatrician. He said, “As much as I desperately wish to play in the NFL, I am also passionate about becoming a pediatrician—something else I’ve dreamed of ever since my doctor cured me of pneumonia when I was little.” Love also defended his decision to skip media day this summer to attend class.